The online game board is broken up into several sections. First select a number from the 'Current Number Selector' by clicking on the number you want. The chosen number will then have a gray background. Then click on the square you want in the Main Puzzle Board. The number will appear in the square. 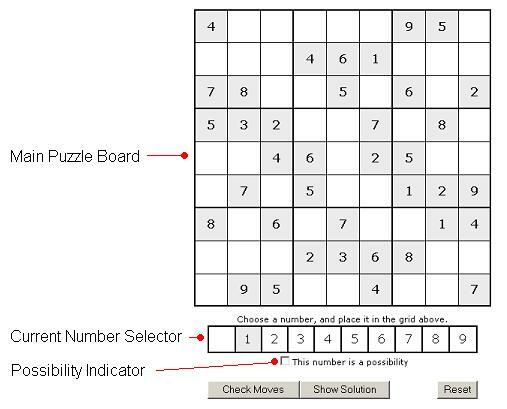 Select the blank square from the 'Current Number Selector' and then click on the number you want to remove in the Main Puzzle Board. THe square will go blank. Alternatively, If you have just placed a number in the main puzzle board, and have the same number selected in the 'Current Number Selector' then just click on the Main Puzzle Board and the number will be removed. Once you have filled up all the squares, the program will tell you that you have completed the puzzle. If you fill in the last square and nothing happens - Bad Luck! One or more of the numbers is incorrect, and the puzzle is not correct. At this stage, you will probably be tempted to try the 'Check Moves' or 'Show Solution' button - but don't give up! You can mark a square as being a possibility for several numbers. Just tick the Possibility Indicator, and then click on the square you want in the Main Puzzle Board. The number selected in the Current Number Selector will be placed in the square, but in a small font. To remove a number from the Main Puzzle Board, select it in the Current Number Selector and then click on the square you want it removed from. When you press the 'Check Moves' button, any squares in the Main Puzzle Board that have been filled out will be checked against the solution. If any numbers are wrong, then you will be asked if you want to see which squares are incorrect. Answer yes, and the squares will be marked in red. Squares that have been marked as Possibilities for numbers are not checked. Hopelessly stuck? If you press the 'Show Solution' button, all the squares will be filled in with the correct numbers. The game doesn't have to be over, though. If you press the button again, then the solution is hidden and the numbers revert back to what they where previously, so you can continue. Clears the board and takes you back to the start. If this is ticked, then when you enter a number as 'solid' (not a possibility) then that number will be removed from the possibilities of the same row, column and 3x3 square. If this is not ticked, then when you enter a number that is not correct, it will flash and immediately be removed. The Wikipedia entry on Sudoku.